The aptly titled, second studio album, All Intertwined, was my first introduction to the all acoustic, instrumental quartet, Might Could. They followed this album up two years later by the equally impressive Wood Knot and as both albums enjoy regular airings, I was delighted to see this new release from the band in August 2013. Also great to see that the band line-up had remained the same, as these four musicians have a chemistry that should and has been preserved. Might Could have an unusual line-up, certainly for progressive circles, featuring three acoustic guitars and an acoustic bass. But folks, don’t let this seemingly bare instrumentation fool you into thinking that there is any lack of depth or complexity to their music. On the contrary there are levels of complexity many a band could only strive to achieve. However I should be wary here not over emphasise the technical nature of the music, as Might Could’s strengths lie in many areas. The delightful, almost playful, way in which the music meshes together is countered, at times, with more dense arrangements. Other sections are allowed to float and breathe – an album on many levels. 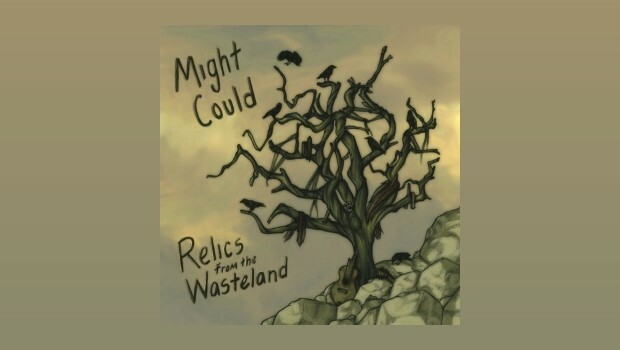 Relics From The Wasteland features ten, relatively short, self penned pieces (Geller, Nasser and Tillotson) and two covers – Samuel Barber’s Medea’s Dance Of Vengeance and Jethro Tull’s Songs From The Wood. Once again Might Could have come up with a thoroughly enjoyable album that combines complexity and dexterity within a listenable and enjoyable framework.